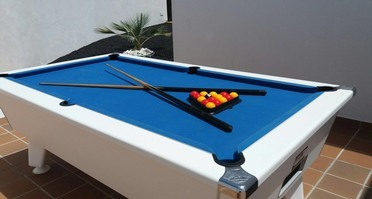 The Omega Outback is a specially designed pool table with a slate playing surface, that can be kept outdoors due to its marine ply construction and weatherproofed cloth. Perfect for anyone who wants to have a unique feature for their garden or patio area - Constructed using only the finest weatherproofed materials and manufactured using the latest machining technology, the Outback features a 3/4" Italian slate, solid bolt supported legs, adjustable height feet and hinged cushion rails with lock brackets for easy access to the slate bed. 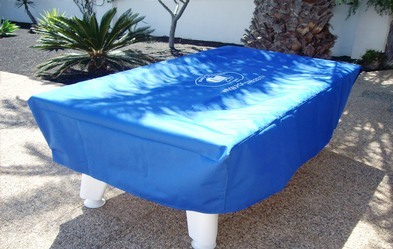 Table comes complete with accessories: size: 7ft x 4ft - this refers to the external dimensions of tihe table.